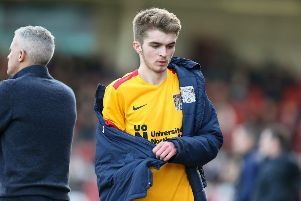 Goalkeeper David Cornell insists he will do everything in his power to avoid the ‘horrible’ feeling of relegation this season after admitting the Cobblers face a ‘dogfight’ to maintain their Football League status. Town have breathing space over the bottom two at present, sitting seven points above the drop with a game in hand, but their recent form – two wins in 13 league games – has fans fearing of a nervous end to the season. It was a horrible feeling last season and personally I don’t want to be involved in that again. I’ll do everything I can to make sure we’re nowhere near it. And their concerns were hardly helped by Saturday’s capitulation against Colchester United when Cobblers succumbed to a first home defeat in the league since September. “I thought it was a strong team,” said Cornell. “I looked at it on Friday and felt it was a very strong side but I don’t know what went wrong. “We just need to grit our teeth. I know things aren’t going well but you can’t just hide from it. You have to grit your teeth and pull your socks up and go for it again. “We didn’t do that on Saturday but we have to get rid of that because we play Tranmere on Tuesday and then we’re at Lincoln on Saturday. “We have to get something from every game from now until the end of the season. We’ve got 16 games left and we need 17 points minimum so we’ve got to be winning games rather than drawing and losing games. “It’s tough but we’re in a dogfight and as I said we’ve got to grit our teeth and get points on the board as quickly as we can. Cornell was part of the Northampton squad that suffered relegation from League One last season, and he’s desperate to avoid the same fate 12 months later. He added: “It was a horrible feeling last season and personally I don’t want to be involved in that again. I’ll do everything I can to make sure we’re nowhere near it and I’m sure the rest of the boys will do too. Defender Charlie Goode also admitted his new team require some positive results to pull away from danger, saying: “We need to pick up points. “It’s been mentioned in the changing room that Tranmere and Lincoln are two tough away games but we want to be taking points as early as possible and a good result on Tuesday will set us up for the league leaders on Saturday and it would give us a lot of confidence.